363 Marlborough is located on the NW corner of Marlborough and Hereford, with 20 Hereford to the east, across Hereford, 365 Marlborough to the west, 17 Hereford to the north, and 364 Marlborough to the south, across Marlborough. 363 Marlborough was built in 1872-1873, one of four contiguous houses (363 Marlborough and 13-15-17 Hereford). 363 Marlborough was numbered as 365 Marlborough until about 1888 when a new house was built to the west and given that number. The land on which 363 Marlborough and 13-15-17 Hereford were built was part of a larger parcel purchased on June 12, 1868, from the Boston Water Power Company by Daniel Davies. a housewright and carpenter. He and his wife, Amity Bacon (Hastings) Davies, lived at 131 Mt. Vernon until the early 1870s, when they moved to 445 Beacon. 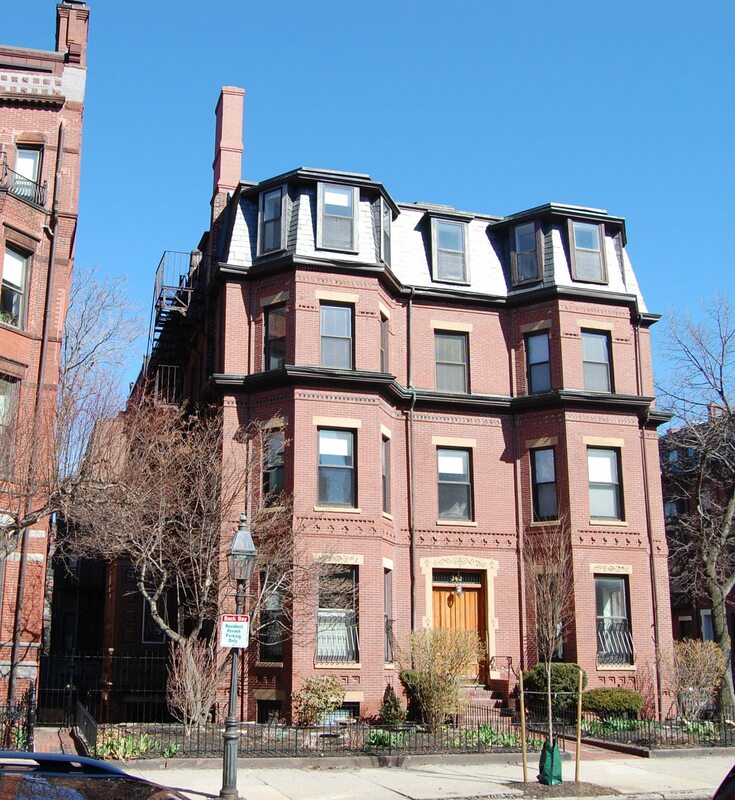 The lots for the four houses were purchased from Daniel Davies during 1872 by Silas Whiton Merrill, a building contractor; he and his wife, Eliza Belcher (Crabtree) Merrill, lived in the Longwood district of Brookline. Silas Merrill purchased each lot separately and resold two, at 15-17 Hereford, to John Floyd Richardson, a mason; he and his wife, Mary L. (Dimick) Richardson, lived in Cambridge. Silas Merrill and John Richardson probably worked together to build the houses, as they later did on at least two other houses, at 31 –33 Fairfield, in 1877-1878. 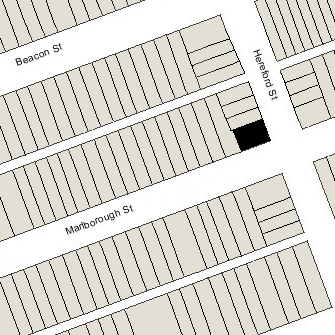 The deeds for 13-15-17 Hereford included a 3-1/2 foot wide easement at their western boundaries providing a passageway for access to the alley for them and for the lot at 363 Marlborough. Click here for an index to the deeds for 363 Marlborough, click here for a plan of the original land, and click here for further information on the land on the north side of Marlborough between Hereford and Massachusetts Avenue. 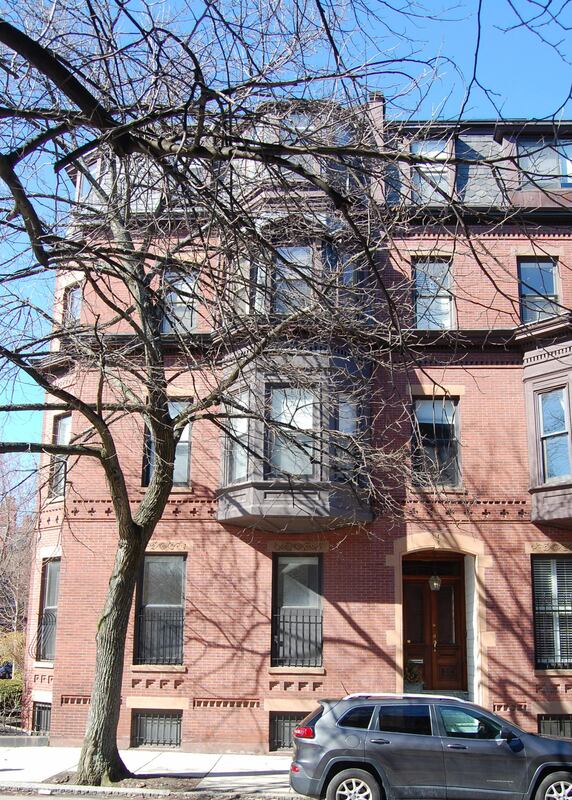 Silas Merrill purchased the lot on which 363 Marlborough was built on December 9, 1872. On May 26, 1874, 363 Marlborough was purchased from Silas Merrill by Mary T. (Cumston) Richardson, the wife of Spencer Welles Richardson. They previously had lived in Milton. In 1887, the Richardsons built a new home on the lot to the west, where they moved when it was completed. The new house was numbered 365 Marlborough and their former home on the corner was re-numbered 363 Marlborough. 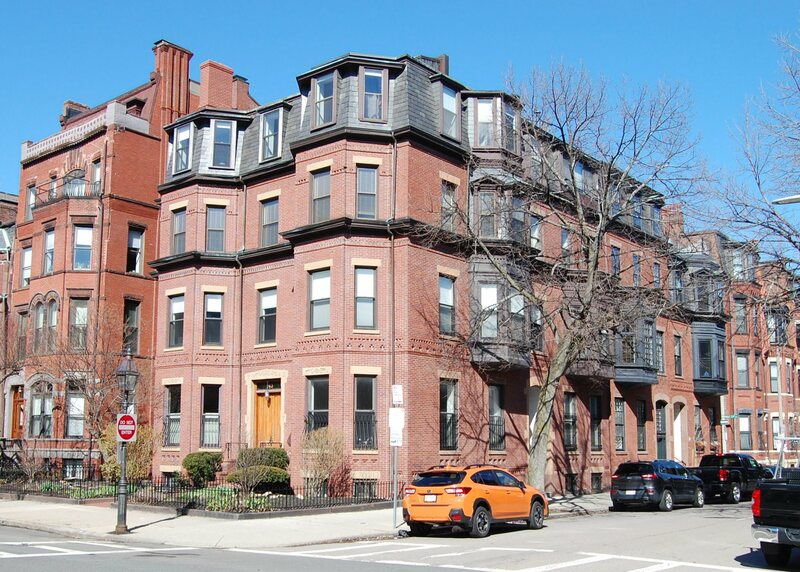 In building their new home, the Richardsons transferred a strip 4 feet wide from the west edge of their lot at 363 Marlborough; as a result, the new house was 28 feet wide on Marlborough but only 24 feet wide at the alley. On June 15, 1888, 363 Marlborough was purchased from Mary Richardson by Frank Staples Sherburne. He and his wife, Annie Cora (Seavey) Sherburne, made it their home. They previously had lived at 350 Marlborough. Frank Sherburne was an importer and dealer in window and plate glass. Frank Sherburne died in September of 1910. 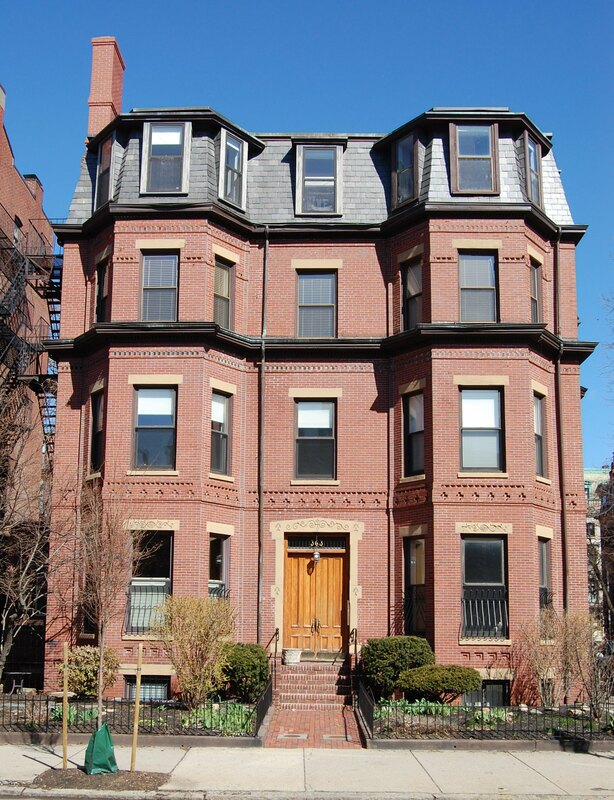 Annie Sherburne and their son, Kenneth Sherburne, continued to live at 363 Marlborough. Annie Sherburne died in February of 1917. 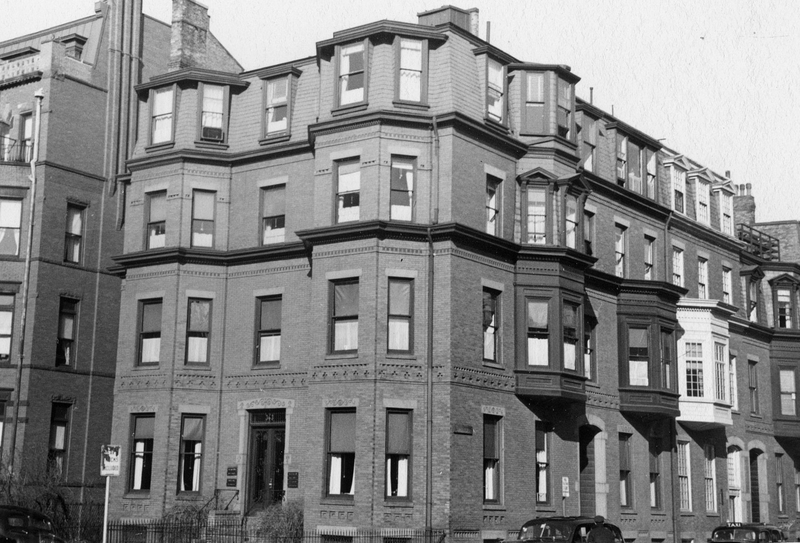 Kenneth Sherburne continued to live at 363 Marlborough in 1925. At that time, he was treasurer of the Federated Film Exchange Co.
On April 14, 1925, 363 Marlborough was acquired from Kenneth Sherburne by his maternal aunt, Miss Flora (Florence) Adelaide Seavey, and he moved to an apartment at 405 Marlborough to live with her. On December 2, 1925, 363 Marlborough was acquired from Flora Seavy by Edna Winifred (Dailey) Miner, the wife of Dr. Leroy Matthew Simpson Miner. He was a dentist, dean of the Harvard Dental School, and a professor at Harvard Medical School. They lived in Newtonville. In December of 1925, Edna Miner applied for permission to convert the property from a single-family dwelling into doctor’s offices and one caretaker’s apartment. The application subsequently was abandoned, but in April of 1926, Leroy Miner applied for (and subsequently received) similar permission to convert the property into doctor’s offices and one dwelling. After the building was converted, Dr. Miner maintained his medical offices there. The apartment was occupied by Alfred A. Lloyd and his wife, Alice Lloyd. He was assistant building superintendent, and later would become building superintendent, of Harvard Dental School. They continued to live there until the late 1950s. On January 30, 1963, Edna Miner transferred 17 Hereford and 363 Marlborough to her husband and their two sons, Richard Leroy Miner and Robert C. Miner, who also were dentists. Dr. Miner continued to maintain his offices at 363 Marlborough until his death in 1964. Richard Miner and Robert Miner also maintained their dental offices at 363 Marlborough. On June 1, 1971, 363 Marlborough and 17 Hereford were purchased from Robert Miner and Richard Miner by Bernard Yudowitz and Arthur H. Rosenberg. On June 3, 1971, they transferred the property to themselves and Martin Goldman, and on September 6, 1972, Bernard Yudowitz and Martin Goldman acquired Arthur Rosenberg’s interest. In December of 1973, they applied for (and subsequently received) permission to convert 363 Marlborough and 17 Hereford from medical offices and one apartment into eleven apartments. On December 31, 1976, Bernard Yodowitz acquired Martin Goldman’s interest in the properties. On October 15, 1980, the Marbo Corporation (Paul G. Roiff, president and treasurer) purchased 363 Marlborough and 17 Hereford from Bernard Yudowitz. In June of 1981, it applied for (and subsequently received) permission to convert the properties from eleven apartments into nine apartments. On February 26, 1982, the Marbo Corporation converted the properties into nine condominium units, the Marlborough/Hereford Condominium. The two buildings remained separate properties with a common entrance on Marlborough Street and connecting hallways inside.